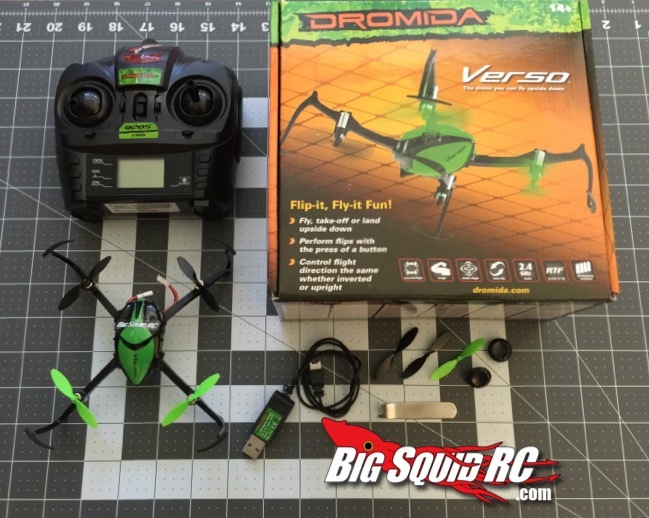 Dromida Verso Quadcopter Review « Big Squid RC – RC Car and Truck News, Reviews, Videos, and More! With what seems like a new quadcopter hitting the market every day, it’s getting harder and harder for manufacturers to set themselves apart in this ever-expanding market. The new Verso from Dromida does just that by introducing a unique and innovative feature: Inverted flight! Lets take a deeper look and see if the Verso can hold up to the infamous Big Squid review beat down! Competition: This is a tough one. There are ton of available micro and mini RTF quads on the market right now, but none with the Verso’s inverted flight capability. The closest competition would probably be the The Blade Nano QX or the Estes Proto X. Needed to complete: Not a thing! 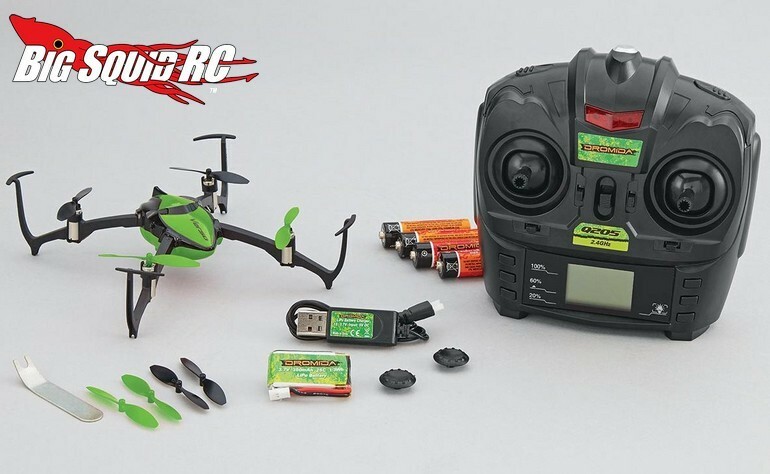 Everything you need to get flying and flipping comes in the box, including the AA batteries for the transmitter! Setup notes: There isn’t much to talk about here (that’s a good thing!). 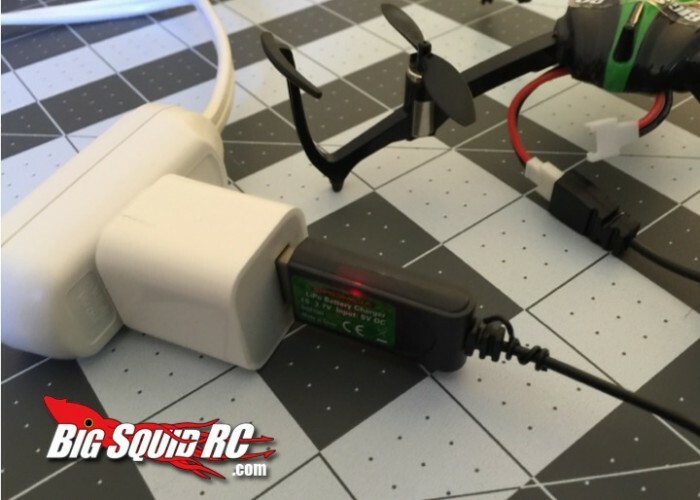 Charge the battery with the included charger, power up the transmitter, power up the quad and hit the skies. There are, however, a few things I want to mention with regard to setup. There is a red LED on the charger to indicate when the battery is charging. When charging is completed, the light shuts off. This is pretty standard issue stuff for RTF chargers, but the problem here is that the red LED is INCREDIBLY dim. I’m not sure if this is specific to the review unit I received or if all the quads are like this, but it makes for an unnecessarily difficult visual indicator. Another thing worth mentioning relates to the battery connectors on the LiPo and the quad. Although you definitely want a snug connection when it comes to flight packs, the connectors here are way too tight. This can be a problem on a micro quad when all the wires and solder joints are so small. It seems like it would be easy to rip the wires clean off the flight controller while wrestling with the battery. Finally, the interchangeable thumb sticks on the transmitter are a nice touch! The Verso comes with standard sticks as well as the thumb pad style found on a lot of micro quads. Overall, setup was a breeze. Transmitter: The included transmitter is a great little unit. The thumb sticks feel pretty smooth and the buttons and switches provide a satisfying “click” when pressed. It feels nice in my (average sized) hands and is not too small like some of the transmitters included with other micro quads. The LCD screen is easy to read and provides all the info you need, including trim switch locations, selected flight mode (or rate percentage in this case. More on that later. ), transmitter battery life and LED status. There is even a dedicated button to toggle the LEDs on the quad on and off. The “inversion” button is located on the top right shoulder of the transmitter and is in the perfect place if you ask me. The transmitter’s antenna is also internal which is a nice feature and should be a given on a unit of this size. Flying: Quite simply, the Verso flies like a champ for a micro quad. Literally no adjustments to the trim were necessary for stable flight out of the box and the quad felt very “locked in” from the get-go. This sounds like it should be a given, but with most RTF micro’s, some trim adjustment is usually required. The included 1S battery provides plenty of punch for an airframe of this size and flight times were right around 4 and a half minutes on a full charge. The Verso offers up three different flight modes, all selectable from the transmitter. These modes don’t really have a name as you may be accustomed to seeing (beginner, intermediate, advanced; or for you FPV junkies like me, angle, horizon and acro) and are instead labeled in percentages: 20% – beginner, 60% – intermediate, 100% – advanced. The number of the percentage refers to the amount of control you have over the quad’s rates. This translates directly to the flying experience. Want to get your bearings and fly tame? 20%. Are you an ace pilot ready for some high level maneuvers? 100%. Want something in between? 60%. I have one gripe with regard to the various flight modes. While the first two (20% and 60%) act like how you’d expect them to act, the 100% mode does not. It most certainly is not a true 100% rate mode and feels more like 65-75%. That is to say, it’s far too tame. I say if the mode is offered, it should be “no holds barred”. This feels more like a patronizing attempt at making pilots feel more competent than they are, which in turn, limits the true capabilities of the quad. Range on the Verso is excellent, bordering on unbelievable. Good range is to be expected from any 2.4ghz set up, but I was able to get nearly 200 feet away before I began to see any packet loss or glitchy behavior from the quad. High marks all around here. Outdoor flight was hit or miss. In a slight breeze, the Verso does well. Anything beyond that though, and the brushed motors and light airframe begin to struggle. I’d say keep this little guy inside (with plenty of space) or fly outside when the weather is just right. This isn’t really a complaint and is more just expected behavior with a quad of this size. One other quick note: When performing more aggressive maneuvers (such as using the inversion feature), the flight battery tends to slide around a bit. This can be corrected with a bit of servo tape, but it is definitely worth noting. 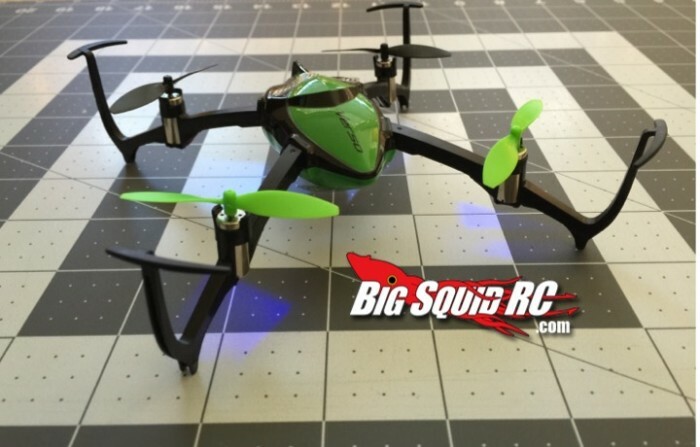 I don’t believe that the battery will fly out of the quad or anything crazy, but it can definitely affect the center of gravity and thus, the flight characteristics. Inverted flight: Now THIS… is cool. Being the main feature touted by the Verso, I thought it worth mentioning some specifics about flying inverted. By simply pressing a button on the shoulder of the transmitter, the quad will beep a couple of times and then flip over while maintaining flight! This gives the quad an almost 3D feel and allows for some incredibly snazzy maneuvers. The default mode is a 180-degree flip. By pressing the flip button down for two seconds, you can switch between 180 and 360 degree inversion. This mode works a treat. The motors don’t miss a beat and the quad performs a clean flip and maintains its height and orientation. The heading does a 180 when you flip as well, so you can maintain flying in whatever direction you were headed. You can also take off and land in both orientations. This is cool stuff! Durability: Because it is such a lightweight, the Verso is incredibly durable. 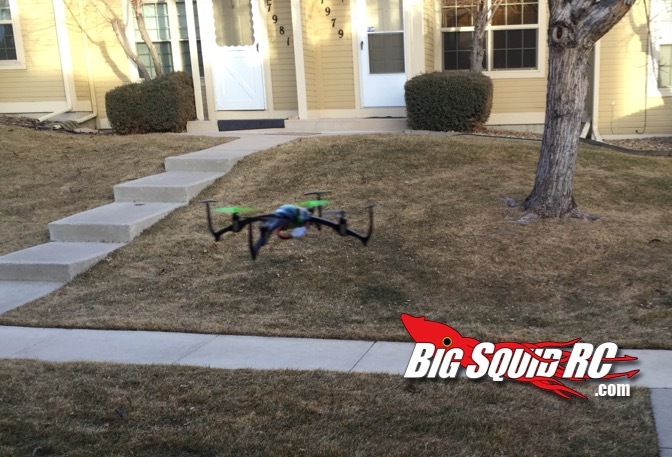 I gave it the old Big Squid beatdown by flying full speed into my ceiling, the sidewalk, and a few walls. Other than a couple of broken props (to be expected with any multi rotor) and one of the motors popping loose (which I easily slid back into place with no further damage), nothing broke. The frame is designed well and the arms are “boxed”, creating great rigidity. One more note regarding durability: I noticed out of the box that one of the props kept flying off way to easily. After changing it out with one of the provided replacements, the issue disappeared. This is definitely something to take note of before you take off for the first time. Time To Bash: B With the included transmitter batteries and a relatively low capacity flight pack, I was charged up and in the air in about 20 minutes. Workability: B There isn’t much to work on here. The flight controller is all self contained and the only regular maintenance will be replacing props. Worst case scenario would involve possibly soldering motor wires and that would be a cake walk thanks to the layout of the Verso. Car Show Rating: C Visually, the Verso is pretty standard fare. Available in four colors (red, yellow, blue and green), you can definitely find one that suits you, but the overall design is nothing to write home about. Bash-A-Bility: B The Verso took a beating. Plain and simple. I tried hard to break it and was unsuccessful. Aside from a few props, the damage tally is minimal. Fun Factor: B This quad is a blast to fly. It handles well, is suited to both new and experienced pilots and the inverted flight really opens up some fun possibilities. Handling: C The Verso handles well. 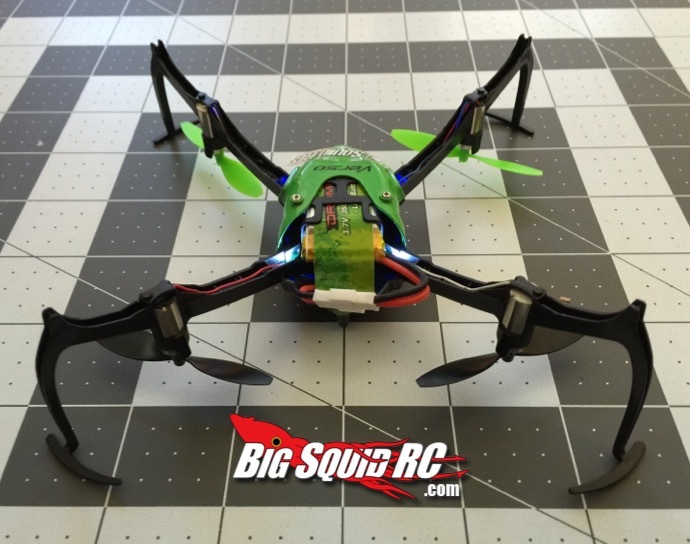 It feels a bit sluggish at times, even in 100% rate mode and I feel that it could stand to be a little bit more nimble for such a lightweight and small quad. Value: A $39.99 gets you everything you need to fly and you get a quad that handles well, has a cool one of a kind feature and is incredibly durable. Parts Availability: B Given that its a Dromida product, parts are easy to find. 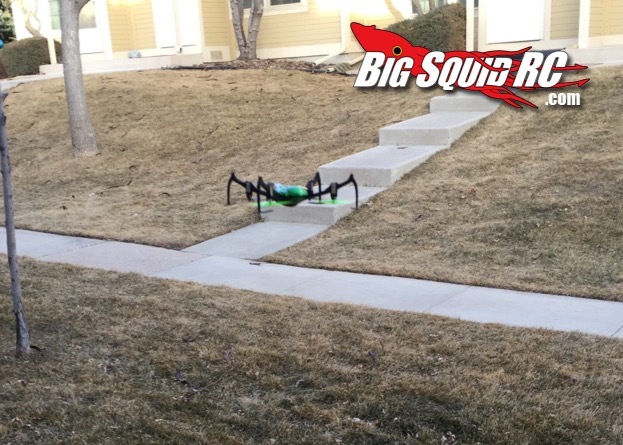 BigSquid Rating: B If you want a cool little quad that is incredibly durable, friendly to both beginners and experts, offers a cool new feature with inverted flight, then the Verso is for you. Since I’ve opened the box, I’ve been flying non-stop while trying to pull off inverted flips through various obstacles around my house. If time spent flying is any indicator of fun, the Verso hits the mark! Want more Dromida news from Big Squid? Click here! You can also check out more info on the Verso page over at Dromida’s website.